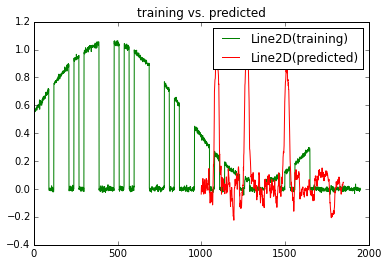 In my previous post I created a Python script to generate training material for neural networks. 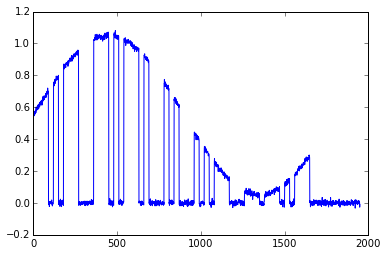 The goal is to test how well the modern Deep Learning algorithms would work in decoding noisy Morse signals with heavy QSB fading. I did some research on various frameworks and found this article from Daniel Hnyk. My requirements were quite similar - full Python support, LSTM RNN built-in and a simple interface. He had selected Keras that is available in Github. There is a mailing list for Keras users that is fairly active and quite useful to find support from other users. I installed Keras on my Linux laptop and using Jupyter interactive notebooks it was easy to start experimenting with various neural network configurations. Using various sources and above mailing list I came up with the following experiment. I have uploaded the Jupyter notebook file in Github in case the reader wants to replicate the experiment. The source code or printed output text is shown below with courier font and I have added some commentary as well as the graphs as pictures. # along with bmorse.py. If not, see <http://www.gnu.org/licenses/>. 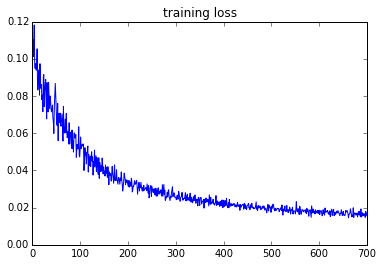 The Jupyter notebook will plot this graph that basically shows the text 'QUICK' converted to noisy signal with strong QSB fading. This signal goes down close to zero between letters C and K as you can see below. The next section of the code imports some libraries (including Keras) that is used for Neural Network experimentation. I am also preparing the data to the proper format that Keras requires. This graph shows the training data (the noisy, fading signal) and the target data (I selected 'dits' in this example). This is just to verify that I have the right datasets selected. In the following sections I prepare the training target ('dits') to proper format and setup the neural network model. I am using LSTM with Dropout and the model has 300 hidden neurons. 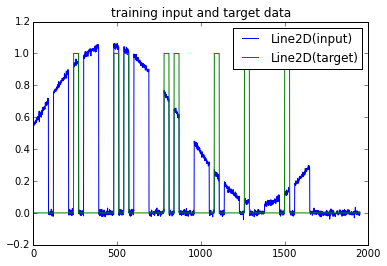 I have also a callback function defined to capture the loss data during the training so that I can plot the loss curve to see the training progress. Here I have started the training. I selected 100 epochs - this means that the software will go through the training material for 100 times during the training. As you can see this goes very quickly - with larger model or larger datasets the training might take minutes to hours per epoch. We have a very small model and small dataset here. The following graph shows the training loss during the training process. This gives you an idea whether the training is progressing well or if you have some problem with the model or the parameters. In this section I am checking the model prediction. Since I am using the training material this is supposed to show a good result if the training was successful. 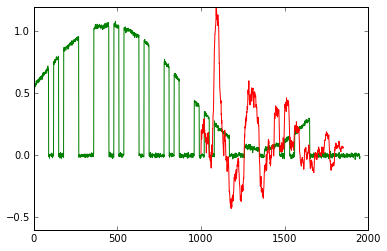 As you can see from figure 4. below the predicted graph (red color) is aligned with 'dits' in the training signal (green color) despite QSB fading and noise in the signal. In the following section I will create another Morse signal, this time with text 'KCIUQ' but using the same noise, QSB and speed parameters. I am planning to use this signal to validate how well the model has generalized the 'dit' concept. Here is the generated validation Morse signal. It has the same letter as before but in reverse order. Can you read letters 'KCIUQ' from the graph below? In this section I use the above validation signal to create a prediction and the plot the results. As you can see from the graph below the predicted 'dit' symbols (red color) don't really line up with actual 'dits' in the signal (green color). This is not a surprise to me. To build a good model that can generalize the learning you need to have a lot of training material (typically millions of datapoints) and the model needs to have enough neural nodes to capture the details of the underlying signals. In this simple experiment I had only 1950 datapoints and 300 hidden nodes. There are only 8 'dit' symbols in the training material - learning CW skill well requires a lot more material and many repetitions, as any human who has gone through the process can testify. Same principle applies for neural networks. In this experiment I built a proof of concept to test whether Recurrent Neural Networks (especially LSTM variant) could be used to learn to detect symbols from noisy Morse code that has deep QSB fading. This experiment may contain errors and misunderstandings from my part as I have only had a few hours to play with this Keras Neural Network framework. Also, the concept itself needs still more validation as I may have used the framework incorrectly. I think that the results look quite promising. In only 100 epochs the RNN model learned 'dits' from the noisy signal and was able to separate them from 'dah' symbols. As the validation test shows I overfitted the model to this small sample of training material used in the experiment. It will take much more training data and larger, more complicated neural network to learn to generalize the symbols in Morse code. The training process may also need more computing capacity. It might be beneficial to have a graphics card with GPU to speed up the training process going forward.